Deconstructing a traditional kitchen gave it better function and a youthful edge for frequent entertaining of adults and teens. In the Village of Mooreland Hills near Cleveland, a family of five was fond of their 1998 Colonial-style home in a wooded neighborhood near President Garfield's log cabin birthplace. The owner has an open door policy that has made the home a social hub for teens, friends, families and clients and she practically lives in the kitchen baking and cooking Italian and nouveau American comfort foods. As the second owner of this home, she asked the original kitchen designer Libby Palmieri of The House of L, for a new plan, one that would better accommodate her needs as a cook, and also retain the traditional feel and luxury statement of the kitchen, but with a more youthful, casual approach. Palmieri opened the kitchen to the dining and family rooms. She added a larger island for easier multitasking with more storage including pop-ups outfitted with electric outlets for small appliances. 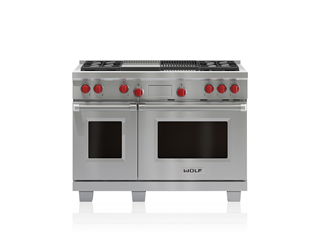 A secondary work sink prevents traffic jams for multiple cooks and the original 36-inch cooktop was replaced with a 48-inch Wolf. "I find Sub-Zero, Wolf, et Cove work for cooks who really utilize their appliances to the max and need commercial-like efficiency with the ease of the features Sub-Zero, Wolf, et Cove offer," Palmieri says. The former peachy palette was replaced with neutral finishes in a variety of textures including the Sub-Zero refrigerator and freezer that add the industrial appeal of stainless steel. A farmhouse sink and plank-top table with easy-to-clean bench seating are anything but fussy, and a four-foot tall chandelier is decorative but so spartan it reads more like the suggestion of one. Still, it draws the eye through the space and makes the table below the ten-foot ceiling feel like a cozier destination. Mission accomplished. "No matter how big the home, or how many rooms, people are always in the kitchen," Palmieri concludes. "It's a gravitational force."